The Tony Awards are rapidly approaching, with the telecast scheduled for 8/7c on June 12. I decided to challenge one of our newest contributors, Colin, to try and predict who will win all the categories, and I did the same. Our predictions are below…once the awards are announced we’ll see who wins. Colin’s pick: War Horse. A very deep and inventive play – all the neat puppetry with the horse figures and the intense World War I aura. The play itself is also British-based and so it has Shakespeare in its genes. Liz’s pick: I’ll have to go with Colin on this one. It was a giant hit in London, and now it’s a giant hit on Broadway. Colin’s pick: The Scottsboro Boys. Author David Thompson graduated from Northwestern University, where I went to school—so he’s obviously brilliant. Liz’s pick: The Book of Mormon. It’s a lot like South Park and Avenue Q, which are both awesome. They’re stars now, but what were some of the best known artists of today doing before they made it big? I chose five newer artists and bands and found out what they were doing ten years ago. Then known by her birth name of Stefani Germanotta, in 2001 the young Lady Gaga was a sophomore in high school. She attended New York City’s private Convent of the Sacred Heart school, which also counts Nicky and Paris Hilton, several Kennedys, and a Vanderbilt as alumni. According to her website, Gaga was performing on the club circuit during this time, especially at the prestigious nightclub The Bitter End. The TicketNetwork car had another race this past Friday, and we have some great pics! Below you can see a sweet action shot of the car in motion, and you can also see that we were in 4th place at one point during the race! JJ is working hard to keep improving, and we’re excited to see how the summer turns out. A lot of people love going to the theatre, but they’re unsure about what the rules are. What do you wear to a Broadway show? Do they have snacks? Can I do a jig during intermission? 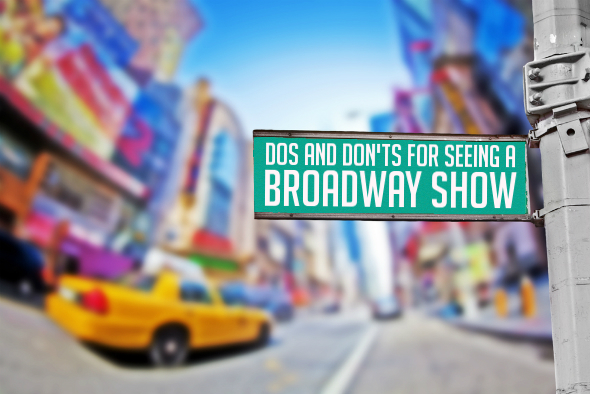 I put together a short list of do’s and don’ts when attending a performance on the Great White Way. DO wear whatever you feel comfortable in. It can be fun to dress up for the theatre, as the custom used to be, but there is no official dress code in any of the Broadway theaters. DON’T wear a giant hat. That’s just mean to the three rows of people behind you. DO shower before going to the theater. People will be sitting next to you for upwards of two hours, and they don’t want to have to smell you, too. DON’T wear an excessive amount of perfume/cologne. See above. DO feel free to buy snacks and show merchandise before the show or during intermission. DON’T wait until the show has started to open the candy bar/bag of chips/[insert other item with an annoyingly loud wrapper here]. Not cool.